Part 1 in a series of guides about how to stop condensation in loft space, attics and roofs. Where condensation occurs around the home. Our top 6 tips on how to stop condensation. 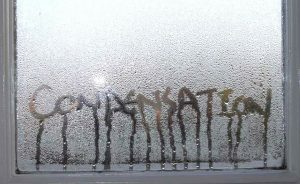 Condensation is one of the most common problems found in UK properties today. Although more prevalent in the colder autumn and winter months, moisture can build up at any time of the year. Finding damp in loft space, moisture on insides of windows, or black spots on your walls are all signs that its present and causing problems. It is estimated that 1 in 5 UK homes are affected. While you may think that draughty older properties are more likely to succumb, it is just as common in well insulated new builds. In fact, insulation, which makes our homes more energy efficient, can have a negative effect by reducing ventilation and the property’s ability to ‘breathe’. This may lead to high levels of humidity inside the home, and ultimately, condensation. Condensation occurs when warm air full of moisture, comes into contact with cold surfaces. When the warm air hits the colder surface, it is unable to retain its moisture levels. Small droplets of water (‘dew’) are released. This is particularly noticeable on windows during winter months when outside temperatures are much colder than our heated interiors. If left untreated, condensation may cause all kinds of damp-related health problems such as asthma, bronchitis, and allergies. It can also damage the fabric of your building through creating the ideal conditions for rot and rust to take hold. In addition to temperature differentials caused by the weather, it can also be created by everyday activities. Cooking, showering, boiling the kettle, using the tumble dryer, drying clothes next to radiators, and even breathing help contribute to this menace. This is why it can be found in all areas of the home including lofts, living rooms, kitchens, bathrooms and bedrooms. During warmer summer months, when windows are left open and the home is well ventilated, it is much less of a problem. As soon as temperatures start to drop, these activities can contribute to the build-up of warm moisture-laden air in the home. This may result in common problems such as damp in loft, mouldy windowsills, black spots on the walls, and eventually, structural damp. Condensation can occur just about anywhere in the home, workplace, or even the car where humidity levels are high. A fine film of water on windows and mirrors, or condensation in the loft is a sure sign that there is too much moisture in the air. This is when you must take steps to control humidity levels, monitor air temperatures, and improve air circulation. In addition to windows, it may occur on walls, floors, ceilings, attics, and roof spaces, and so it is important to check the whole house. As with most things in life, prevention is always better than cure. You should always take preventative steps as soon as you see water gathering. Fortunately, this is normally a seasonal problem that can disappear altogether in the warmer summer months. If you can create a well-balanced environment in your home year-round, you could eradicate the problem for good. With a prevention plan, it is possible to reduce or eradicate it from your home and prevent mould or rot from developing. One of the easiest ways to combat condensation in your loft space is by keeping your home well ventilated. You can do this by ensuring all air vents are unobstructed (or install loft ventilation products if none are present). Open windows every day, especially bathroom and kitchen windows where condensation is known to be a problem, and by airing your home often. If you have window vents, leave them open, even in the colder months to ensure a constant flow of fresh air. • Install Extractor Fans in Bathrooms & Kitchens. Extractor fans are relatively inexpensive and easy to install, yet they are highly effective at stopping condensation in kitchens and bathrooms. By using extractor fans when cooking or bathing, you will significantly reduce the amount of moisture released into the air, and keep it at bay. • Check Loft Hatches and Light Fittings. If your loft hatch doesn’t seal correctly or your light fittings are loose, moist warm air generated in your household could easily travel up into the colder loft space. Here it will instantly condense. Small upgrades or repairs to your loft hatches can put an immediate stop to your problems. Consider the excellent range of Manthorpe Loft Hatches from Manthorpe Building Products. • Do Not Dry Clothes Inside. It can be tempting to take advantage of the central heating during the winter months and use radiators to dry clothes. This, however, is one of the easiest ways to fill your home with condensation. If you are unable to line-dry your clothes outside, use a well-ventilated tumble drier. It may not be as energy-efficient, but it could save on expensive damp repairs in the future. • Open / Close Doors. If you are heading out for the day, leave interior doors open so that the air can circulate naturally. When taking a bath or shower, close the bathroom door to contain the condensation generated, and open a window or use an extractor fan. Likewise, when cooking you should close the kitchen door to contain any moisture and use an extractor fan to expel condensation outdoors. Position furniture (or boxes in your loft) at least 5 cm away from walls. This will allow air to circulate and helps prevent mould on walls. In many instances, problems can be solved quickly, and without a huge investment. By implementing the top tips listed above, you could improve air circulation in your home and significantly reduce condensation levels without calling on the professionals. But if your problems are critical, it is important that you find the underlying cause and make the necessary home improvements to prevent the onset of damp. Previous Previous post: What causes condensation in roof, attics and lofts?